In 1867, the year of Confederation, Canada opened its arms to the world and received 10,666 souls or a whopping 0.3% of its population. Actually, the statistic refers to those over 15 who migrated to Canada and became permanent residents. It allows a reasonable comparison with later yearly figures. Many, if not most, of those ten thousand odd migrants came from the UK and Ireland. Forty years later in 1907, with a transcontinental railroad finished and much of the West now divided into proud new provinces, the number of migrants to Canada soared to 272,409 or 4.2% of the population, the highest figure yet, higher than the previous high of 3% in 1883. Of those 272,409 migrants in 1907, slightly more than 120,000 were from Great Britain and Ireland. Some 56,000 were from Europe and about 74,000 from the USA. About half in 1907 were from the UK and Ireland. By 1927 that proportion had fallen to slightly more than a third. That proportion stayed roughly the same through the ‘60s with British immigrants to Canada comprising about a third of the total. 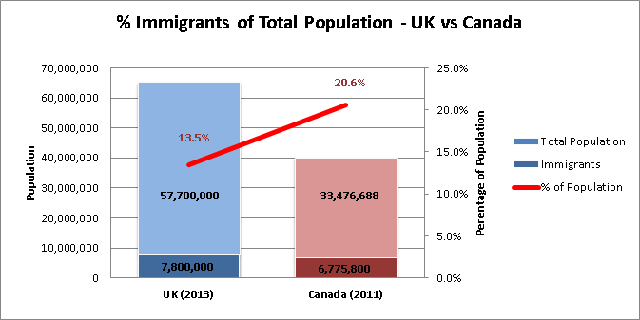 By 2012, about 2.5% of immigrants to Canada came from the UK. In other words, over the last 50 years the UK has gone from having a modest or even negative rate of net migration into the country to accelerated rates of migration into the UK in the last 2 decades, especially in the first decade and a half of the 21st century. Its net migration rate from 2000 to 2012 more than doubled, meaning those who chose to move to Britain increasingly exceeded those who chose to leave Britain. Canada over the same period has maintained – as a percentage of the total population – a reasonably constant flow of immigration compared to the UK. ¹Principal applicants for permanent residence along with spouses and dependants. 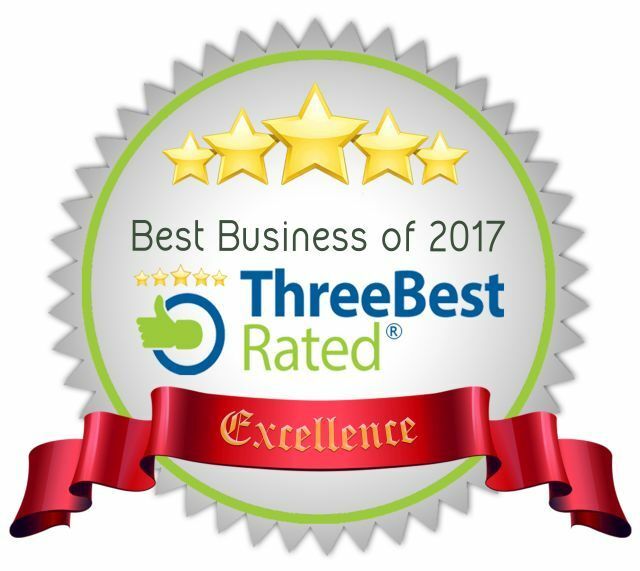 ²The numbers refer to the specific year and are not a five-year average. The table shows that, aside from a few years, the rate as a percentage of the total population over the period 1963 – 2013 has been consistently below 1.0%. 1967, the year of Expo 67 saw a rate of 1.1% while 1966 had a rate of 1.0%. Since 1974, when the rate hit 1.0%, it has remained below that level, varying between a low of 0.3% in 1984 and 1985 to a high of 0.9% in 1993. Since 1993 it has remained in the range of 0.8 to 0.6 with 0.7 occurring 12 of the 20 years from 1994 through 2013. The decade from 1903 through 1913 saw far higher proportional flows of immigrants with the percentage rising from 2.3 in 1904 to 4.2 in 1907 to 5.3% in 1913 when the total number of immigrants was 400,870, well over half as much as the absolute numbers in 2013. 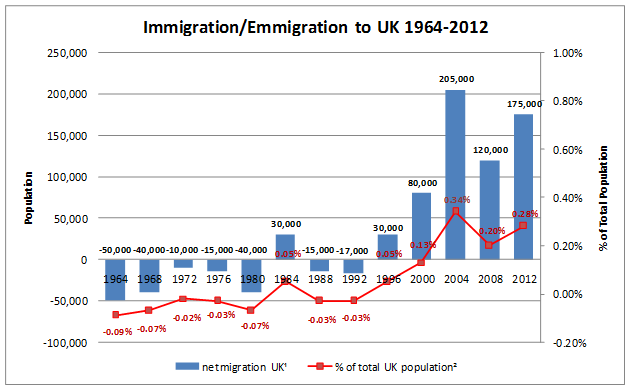 To have a similar proportional amount of immigrants in 2013 as in 1913 we would need almost 2 million immigrants in 2013. ² https://www.populstat.info/Europe/unkingdc.htm for UK population estimates. Brackets mean net emigration out of the UK. The above table shows that net migration in the UK was a relatively small percentage of the total population and was even negative at times with emigration often exceeding immigration in the ‘60s and in the early ‘90s. Even with the large uptick in immigration into the UK in the first decades of the 21st century, net migration as a percentage of the total population is less than half the Canadian percentage in the same period, 2000 – 2012. The key difference is that Canada has a very low rate of emigration compared to the UK. That means that any given net flow of immigration into the UK results in a greater change in the stock of immigrants as a percentage of the total population in the UK. By 2013, the UK had 7.8 million residents who had been born abroad out of a total population of approximately 57.7 million. That translates into a stock of migrants making up 13.5% of the total population. In Canada, according to the 2011 National Household Survey, Canada had a total of about 6,775,800 individuals who arrived as immigrants, or 20.6% of the total population, the highest in the world aside from Australia. Looking into the future, if current trends continue in the UK, a country with a relatively stable overall population, then the immigrant population will surpass the levels found in countries like Canada and Australia. That is because Canada and Australia are growing countries in terms of total population and any given flow of immigrants will not affect their stock relative to their total populations in as dramatic a fashion as in the UK. The other key difference is the United Kingdom’s legacy of the British Empire which has meant that as former colonies were granted independence in the post-war period, their citizens, as British subjects, were granted with the passing of the British Nationality Act of 1948, the right to live and work in the UK. Concerns over the fact that it meant that hundreds of millions of citizens from around the world were now eligible to migrate to the UK, various acts were passed in the following decades that restricted that right. Nowadays, to qualify for the so-called right of abode you must be a Commonwealth citizen and/or a British subject and have one parent who was born in the UK or have a mother who is, or had been, married to a man with the right of abode. This means that the requirements for immigrating to the UK are now far stricter than 50 years ago. Whether further restrictions are placed on immigration to the UK – a country that would likely have a steadily declining population if not for immigration – remains to be seen.